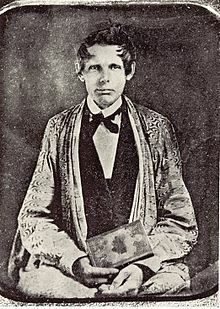 Samuel Austin Worcester was a missionary to the Cherokee, translator of the Bible, printer, and defender of the Cherokee’s sovereignty. He collaborated with Elias Boudinot in the American Southeast to establish the Cherokee Phoenix, the first Native American newspaper. During this period, the westward push of European-American settlers from coastal areas was continually encroaching on Cherokee territory, even after they had made some land cessions to the US government. With the help of Worcester and his sponsor, the American Board, they made a plan to fight the encroachment by using the courts. They wanted to take a case to the US Supreme Court to define the relationship between the federal and state governments, and establish the sovereignty of the Cherokee nation. Hiring William Wirt, a former U.S. Attorney General, the Cherokee argued their position before the US Supreme Court in Georgia v. Tassel (the court granted a writ of error for a Cherokee convicted in a Georgia court for a murder occurring in Cherokee territory, though the state refused to accept the writ) and Cherokee Nation v. Georgia (1831) (the court dismissed this on technical grounds for lack of jurisdiction). In writing the majority opinion, Chief Justice Marshall described the Cherokee Nation as a “domestic dependent nation” with no rights binding on a state. Chief Justice John Marshall laid out in this opinion that the relationship between the Indian Nations and the United States is that of nations. He reasoned that the United States, in the character of the federal government, inherited the rights of Great Britain as they were held by that nation. Those rights, he stated, include the sole right to deal with the Indian nations in North America, to the exclusion of any other European power. This did not include the rights of possession to their land or political dominion over their laws. He acknowledged that the exercise of conquest and purchase can give political dominion, but those are in the hands of the federal government, and individual states had no authority in American Indian affairs. Georgia’s statute was therefore invalid. ^ a b “Worcester v. Georgia”. The New Georgia Encyclopedia. 1832. ^ a b Richard Mize, “Worcester, Samuel Austin (1778-1859).” Encyclopedia of Oklahoma History and Culture. Accessed March 29, 2013. ^ Lumpkin, Wilson. “[Proclamation] 1833 Jan. 14, Georgia to Charles C. Mills / Wilson Lumpkin, Governor of [Georgia]”. Southeastern Native American Documents, 1730-1842, Felix Hargrett Papers, Hargrett Rare Book and Manuscript Library, The University of Georgia Libraries. Digital Library of Georgia. Retrieved 13 June 2016. ^ Collins-Hughes, Laura (2018-01-17). “Fighting for Native Americans, in Court and Onstage”. The New York Times. ISSN 0362-4331. Retrieved 2018-03-30. Berutti, Ronald A. (1992). “The Cherokee Cases: The Fight to Save the Supreme Court and the Cherokee Indians”. American Indian Law Review. 17 (1): 291–308. doi:10.2307/20068726. Burke, Joseph C. (1969). “The Cherokee Cases: A Study in Law, Politics, and Morality”. Stanford Law Review. Stanford Law Review, Vol. 21, No. 3. 21 (3): 500–531. doi:10.2307/1227621. JSTOR 1227621. Lytle, Clifford M. (1980). “The Supreme Court, Tribal Sovereignty, and Continuing Problems of State Encroachment into Indian Country”. American Indian Law Review. 8 (1): 65–77. doi:10.2307/20068139. Worcester, Samuel A. “Account of S[amuel] A. Worcester’s second arrest, 1831 July 18 / S[amuel] A. Worcester”. Southeastern Native American Documents, 1730-1842. Tennessee State Library and Archives. Retrieved 21 February 2018.